The Erie Canal may have made Buffalo a boom town in 1825, but it was the steel industry that made the city wealthy. 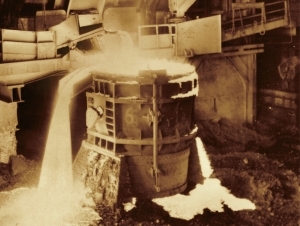 In his book Western New York Steel, Spencer D. Morgan, ’12, tells the story of the rise of the steel industry beginning in the 1900s until its decline in the 1980s. He will be signing copies of his book at the Barnes and Noble at Buffalo State Bookstore on Thursday, March 20, from 4:00 to 5:00 p.m.
Morgan, who earned an M.A. in history with a museum studies concentration, interned at the Steel Plant Museum of Western New York and was hired as its curator. "Arcadia Publishing contacted me about writing the book," said Morgan. "They thought it fit in well with their Images of America series. I wrote the book as a teaching tool, so that future generations can learn how the steel industry affected Western New York. We are still feeling its impact today." The eight-chapter book emphasizes the importance of location, shipping, and transportation to the rise of the local steel industry. The book features 200 black and white images that show the molten steel flowing, the slag dumping into Lake Erie, and the workers celebrating some of their proudest moments. One such moment occurred in October 1942 when Blast Furnace H at Bethlehem Steel set the world record of steel production in one month: 46,246 tons. Morgan traces the local steel story back to 1803 when a blacksmith named David Reese set up shop at the corner of present-day Seneca and Washington Streets. As the waterfront became a major port, steel plants rose on local waterways: Tonawanda Iron Works on the Niagara River; Hanna Furnace and Republic Steel near the Buffalo River; and Lackawanna Steel—later Bethlehem Steel—on Lake Erie. Morgan also tells the story of the Steel Plant Museum of Western New York. It was founded in 1984 when demolition of the old steel plants began. The museum was started with personal collections of artifacts and photographs from the people who earned their livelihood in the steel industry. Those collections are now in the Steel Plant Museum, which celebrates the legacy of the steel industry that undergirds the region. Morgan has had the satisfaction of seeing the Steel Plant Museum develop into a major cultural asset. He will begin the next chapter in his career later this month when he assumes a new position as the director for development and marketing for the Buffalo Niagara Heritage Village, formerly the Amherst Museum.